Painting interior doors is a low cost and easy way to add a decorative touch to your home. Painting interior doors adds style, character and contrast to your walls and rooms. 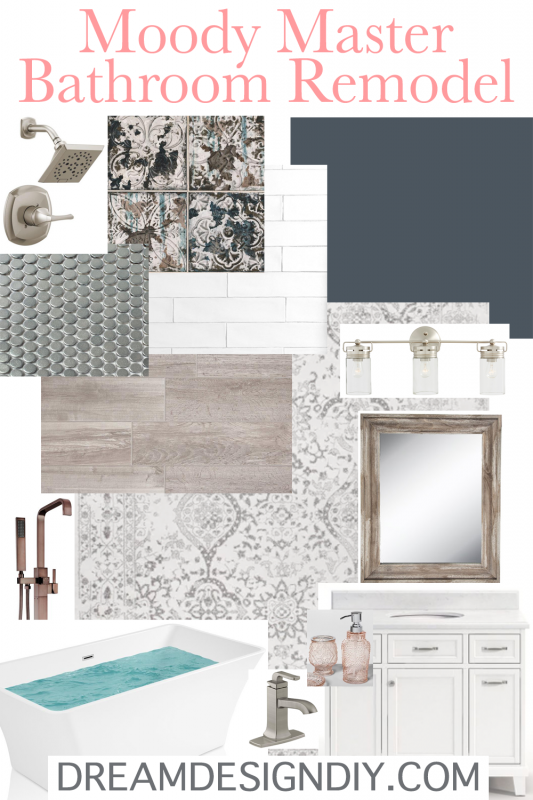 It can make a subtle or bold statement depending on the chosen color. I have seen several different colors and tones that look amazing for interior doors such as blues, greens, tans, grays, reds and even black. Have fun with color and don’t be afraid to experiment in your own space. 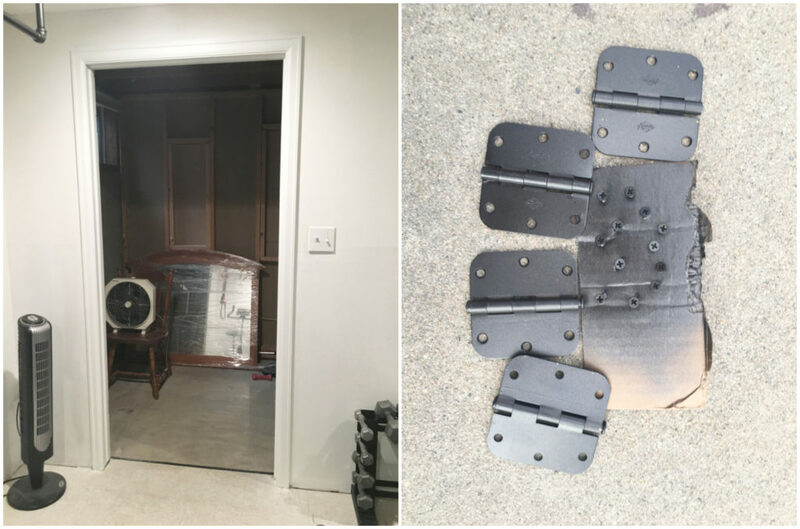 Our door and door trim in our basement home gym were wood color. As you can see there was a lot that was wood color. 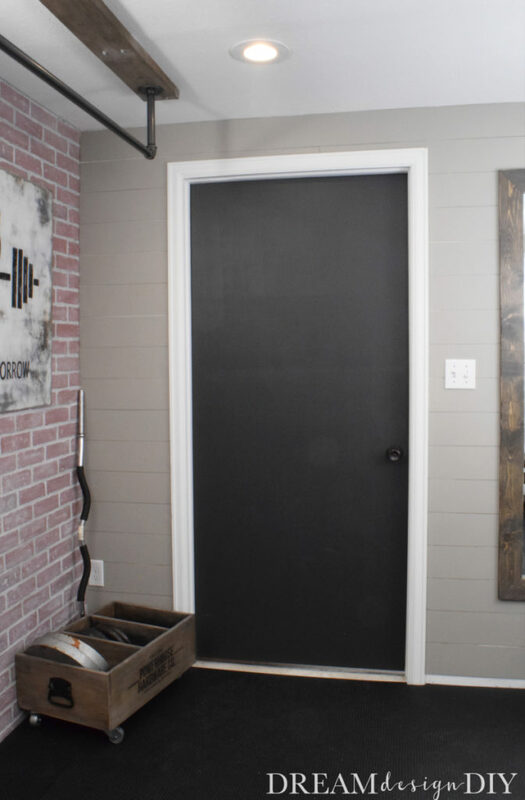 We painted the interior doors during our home gym remodel. Here is what the doors and home gym looked like before. 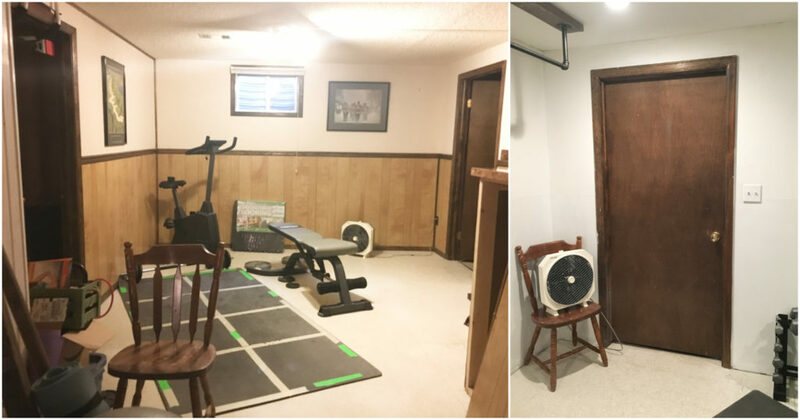 Here is a pic after several weeks of working on the home gym (although we are not completely done…are you really ever done with a room) and the doors. 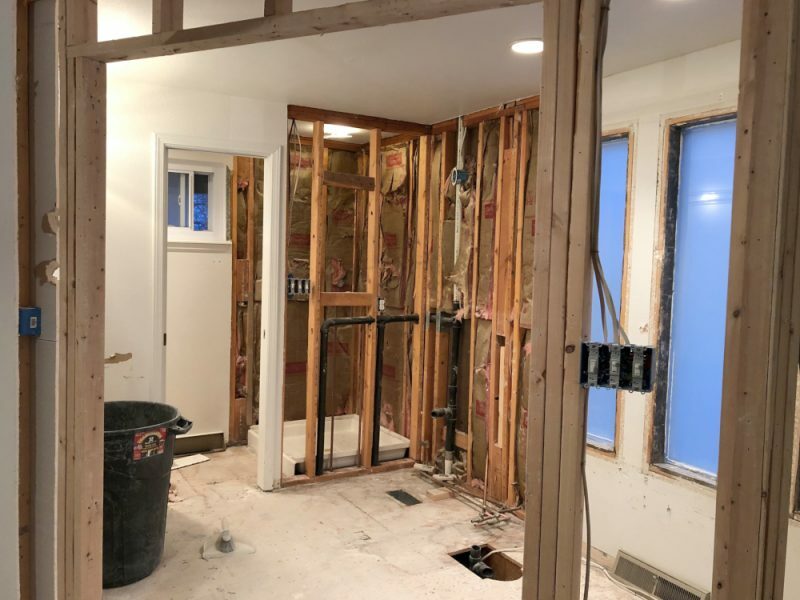 It’s hard to believe it is the same space. If you have never painted a door before there are a few things to consider. DO YOU NEED TO USE A PRIMER? Unless your door is in perfect condition a primer is recommended. Primer helps block stains, helps the paint to stick better and helps the topcoat look smooth and finished. WHAT IS THE BEST PAINT FINISH TO USE ON DOORS? Since doors get a lot of traffic and finger prints a gloss or semi – gloss is recommended. If you go with lesser of a sheen expect marks will not wipe off as easily or not at all and you will need to touch it up with paint to fix it. WHAT IS THE BEST WAY TO PAINT A DOOR? 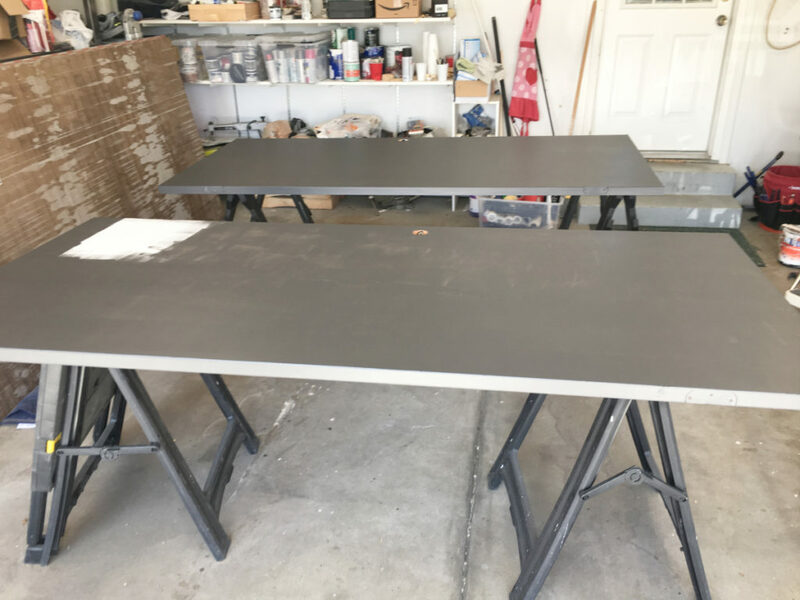 It is best to start out with painting the edges or any panels, trim, etc of the door first with a paint brush then finish the door with a high density foam roller. This type of roller is best for smoother surfaces. Continue reading to see the tutorial on how to paint interior doors. Step 1) We removed the door and hardware. If you don’t like the color of the door hardware now is a good time to either change it out or spray paint it. It is also a good time to freshen up the door trim. You could either use the same paint color or choose a new door trim color altogether. 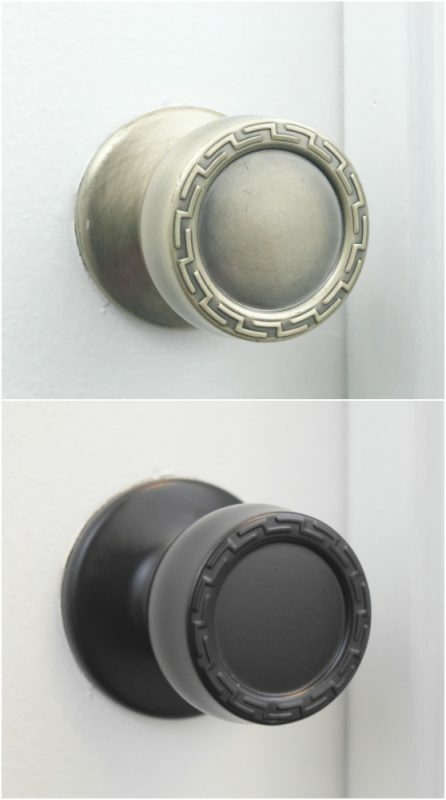 I opted to spray paint our hardware in a bronze color and we also painted the door trim using Sherwin Williams Extra White. After the door was off the hinges we removed all the hardware from the doorway and the door. It works best to lay the door across some sawhorses or platform of some sort when working on the door. Then we cleaned the door. Step 2) I used wood filler to fill in any blemishes/knicks on the door. Once this was dry I lightly sanded it and removed/blew off any sanding dust. Step 3) Using a paint brush we started out by applying primer to the edges of the door. 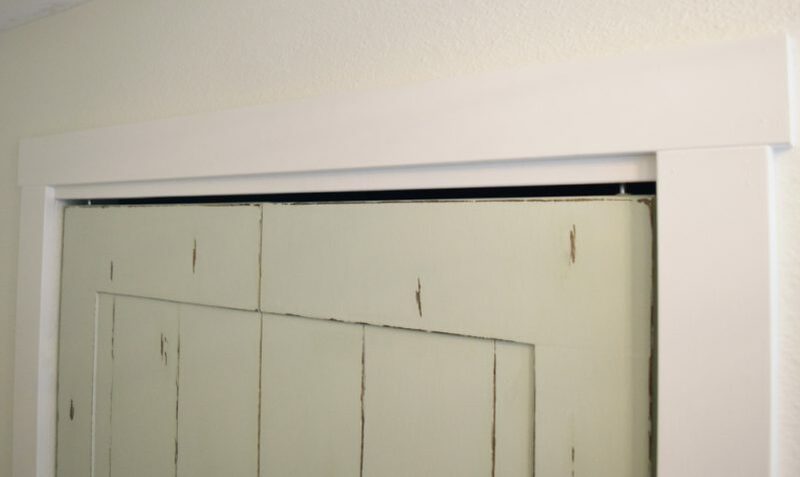 Then to cover the rest of the door I found that a high density foam roller is the best way to apply primer/paint to smoother finishes like a door or shiplap. Allow the primer to dry. Step 4) I applied a couple coats of Iron Ore paint. We initially bought a quart and it ended up being short on paint…oops. So we had to go back and this time we bought a gallon, figuring we would be painting more interior doors. Once this dried we attached the hardware and attached the door to the trim. I admit that I was a little nervous to stray away from the traditional white door, but now I am excited to add color to other doors in the rest of our house as well. Great post and thanks for this. Love the results! Looks cool! Thanks for the tips.